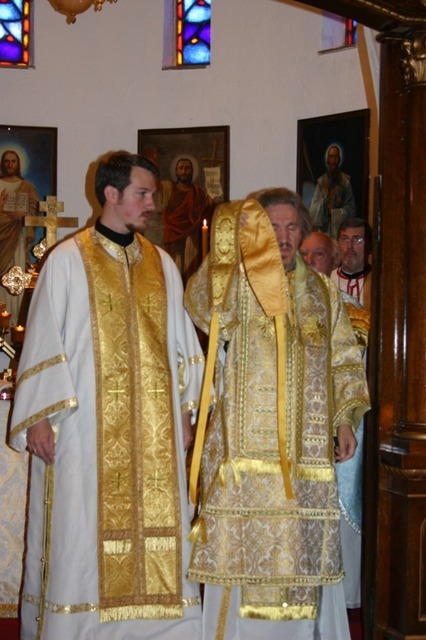 Columbus, OH - In September 28, 2008, Deacon Aleksa Pavichevich was ordained to the Holy Priesthood by His Grace Bishop Dr Mitrofan of Eastern-American Diocese of the Serbian Orthodox Church. His Grace concelebrated the Hierarchical Divine Liturgy with Protopresbyters Mateja Matejic and Dragoljub Pavichevich, St Vladimir's Seminary Chancellor Archpriest Chad Hadfield, and St Stevan's Parish Priest Father Isak Kisin. Father Aleksa and his wife Emily have been active members in the life of Columbus' Serbian Orthodox Parish St Stevan of Dechani. Together they worked on developing the parish website, organizing fund raising activities, planning church events and serving in other capacities including committees, groups and at divine services. In September of 2005, with the blessing of His Grace Bishop Dr Mitrofan and the encouragement of Fr Isak Kisin and Fr Dragoljub Pavichevich, Father Aleksa departed for Crestwood, New York to attend St Vladimir's Seminary. During that time Papadija Emily worked as a special education teacher in the Bronx and studied choir conducting at St Vladimir's. Father Aleksa worked in technical support at the seminary while completing his degree. Father Aleksa and Emily celebrated the birth of their first child, Sophia, during their final year at St Vladimir's. During that final year Father Aleksa also took on the additional responsibilities as a Resident Advisor on campus and as Deacon at St Sava's Cathedral in New York City. The St Stevan's community wish all of the Lord's blessings on Father Aleksa as he begins his priestly ministry.